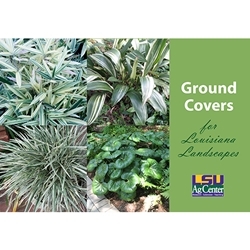 Ground Covers for Louisiana Landscapes provides the latest information and recommendations from LSU AgCenter horticulturists about these alternatives to traditional lawn grasses. This new full-color, 20-page publication includes 19 photographs of some of the favorite ground covers for our area. It covers such topics as choosing the right ground cover, preparing the planting area, planting recommendations, maintenance advice and more.